An archipelago with just one land. As knowing that their group has been well fed. A ladder that feels more than just a rung. Behaviour that somehow feels lost today. The azure-winged magpie (Photo Credit: Andy Maguire). This is a Shakespearian Sonnet, inspired by recent research that exams the selfless behaviour of azure-winged magpies. Researchers found that by setting up an experiment in which a seesaw mechanism was attached to a bird feeder, the magpies selflessly took it in turns to stand on one end of the seesaw, opening up the bird feeder to allow other magpies to feed. A control experiment, with a seesaw mechanism that was not attached to a bird feeder, demonstrated that the magpies only operated the apparatus when their group members could actually obtain the food. 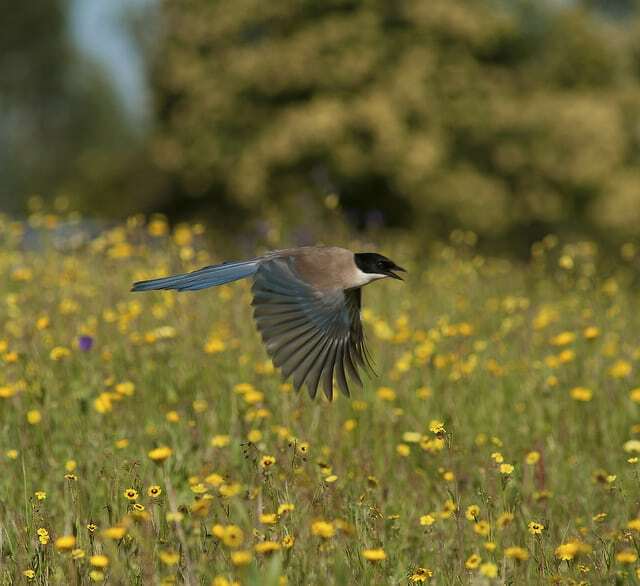 This research suggests that prosocial behaviour exists in species of birds that cooperatively breed (like the azure-winged magpie), which in turn supports the theory that human altruism (i.e. the selfless concern for the well-being of others) evolved from our early ancestors working cooperatively to care for their young. This is known as the cooperative breeding hypothesis. Some of us are born knowing that all sentient fellow passengers on this earth are awake, aware, have complex emotions that we, in our human arrogance, have negated as not possible. Science is slowly showing that this vibrant intelligence of other species is indeed a reality. Thank you for a lovely poetic reminder of the sense of community and family that these remarkable birds share. I was working at a research station in the Frank Church Wilderness and I heard the Magpies go crazy down by the creek. So I was looking that way and suddenly I saw a juvenile redtail hawk flying towards me with a magpie in it’s talons followed closely by a bunch of screeching magpies. It was likely the one that called first to alert the others.